How do the others do it? You’re interested in that too? 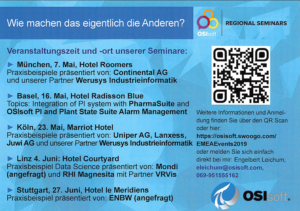 Then visit the OSIsoft Regional Seminars 2019 in Munich and/or Cologne. Kai Weber will present practical examples of how Werusys Industrial Informatics achieves optimal results. The Regional Seminars are aimed at all interested parties and in particular at production managers, data scientists, process managers, digitisation experts and IT managers. Here you will learn how you can get the most out of a central data infrastructure from application examples presented by us, among others. The central storage of data offers a number of advantages, such as compliance with environmental guidelines and significant resource savings through digitization. Manual data manipulation will hardly be necessary in the future and spreadsheets are a thing of the past. With the PI system, violations of limits and reference values can be made visible, thus increasing the service life of the systems.